MIDI Converter Studio is a special audio converter program that converts small MIDI files into popular and universally supported audio formats: MP3, WAV, OGG, WMA. 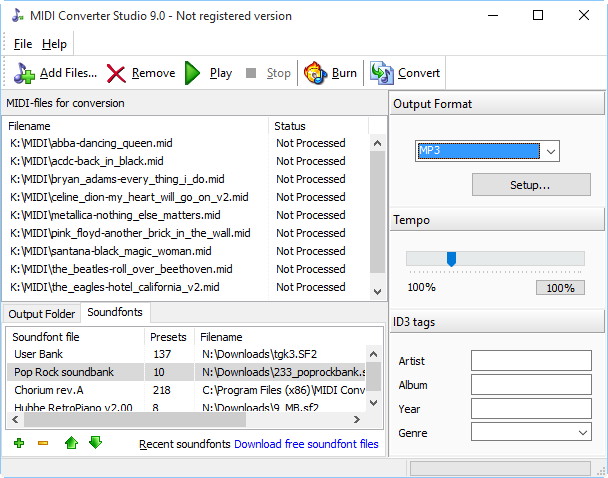 Unlike AudioConverter Studio, which supports quite a number of popular audio formats and accepts any supported format as its input, MIDI Converter Studio works only with MIDI files. There is a good reason for that: although MIDI files are often associated with music, they are not regular audio files. In fact, MIDIs do not contain any audio data at all. MIDI stands for Musical Instrument Digital Interface. As the "interface" part suggests, it's about communication between devices. Indeed, MIDI files consist of various sorts of instructions. Using the instructions, an electronic musical instrument can produce music. So, instead of containing music, MIDI files contain instructions on how to create it. This makes them so small. There are millions of MIDI files on the internet. Classical pieces, popular songs, karaoke. They are mostly free and, because of their small size, are very easy to download. MIDI files are not universally supported. They sound differently if played on different hardware / systems. The both drawbacks can be easily eliminated by converting MIDI to a real audio format. SoundFonts are basically banks of audio samples. Various software and hardware synthesizers use such samples to create music according to instructions from MIDI files. Such samples are normally recorded from real instruments, but they can be reused on various pithes and dynamic levels. You can easily guess that quality of MIDI music depends directly on quality of the available audio samples. Files are converted quickly (as opposed to the sound recording method). If you do not like how various musical instruments sound on your MIDI file, you can simply use a different SoundFont. There are lots of free and paid SoundFonts on the internet. Most of them can be easily added to MIDI Converter Studio and used instead of or in addition to the one that comes with the program. Yes, MIDI Converter Studio can use several SoundFonts at once. You are not limited to so called "collection SoundFonts" that must include samples for all instruments. Quality of different instrument samples in such collection SoundFonts is not always the best possible, so you may want to use one-instrument SoundFonts instead. Like 1 SoundFont for piano, another 1 for guitar, and so on. This can be done quite easily with MIDI Converter Studio. On the "Soundfonts" tab in the lower part of the window, you can add new SoundFonts and put them into the desired order. The program always starts looking for samples from the top. That is, if your MIDI file request a sample for piano, MIDI Converter Studio looks if such samples are available in the topmost SoundFont file. If such samples are not available, the program moves on to the next SoundFont, and so on to the bottom of the list. If you prefer using one-instrument SoundFonts, I would still recommend to put a collection SoundFont at the bottom of the list. This will make sure that all instruments from your MIDI file will be represented (played). MIDI Converter Studio 9.0 is fully compatible with all editions of Windows 10. The program also works on previous versions of Windows (XP, Vista, 7, 8, 8.1).